The heavy marbling and distinctive seams of thick fat that make the rib-eye so irresistibly tender is a mixed blessing when your steak meets the flames of a grill. On one hand it makes the meat unusually forgiving, since fat acts as an insulator and protects the steak from overcooking. 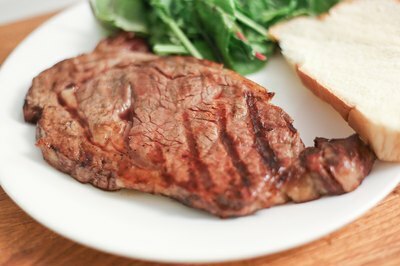 Unfortunately, as that fat melts and drips away, it also tends to ignite and cause flare-ups that can char your steak and give it an acrid, burnt taste. For thick, slow-cooking rib-eyes, an unconventional technique gives the best results. The rib-eye steak and its larger counterpart, the rib steak, come --logically enough -- from a section of the loin that passes through the rib cage. It's the same cut that yields prime rib roasts, and the steaks are similarly tender and well-marbled. A rib-eye is simply a rib steak with the large cap muscle and rib bone removed, leaving the central "eye" muscle. 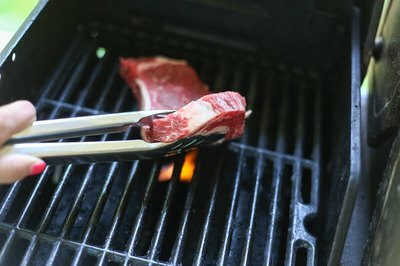 Rib steaks are best when cut thickly, and trimming one down to a rib-eye keeps it to a single-portion size. 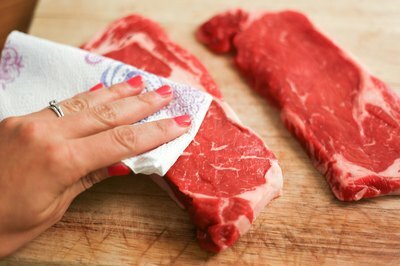 Remove your steak from the refrigerator and blot up any surface moisture with fresh paper towels. Butchers sometimes cut away a seam of fat from the rib-eye, leaving part of the steak barely attached. If that's the case, tie the steak with butcher's twine or pin the loose piece in place with a wooden toothpick. 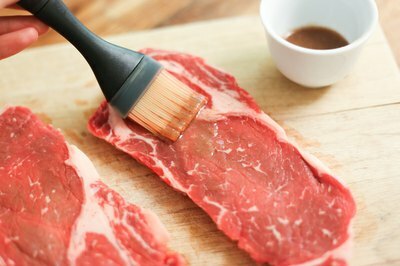 Brush the steak lightly with a marinade, if you wish. Rib steaks are flavorful and tender enough not to need marinating, but that's a matter of personal preference. Worcestershire sauce, or a mixture of Worcestershire and soy sauce, works well as a simple marinade. Both of these prepared sauces are rich in savory flavor compounds that increase the steak's "umami," enhancing its rich and beefy flavor. Season the steak generously with coarse sea salt or kosher salt, if you opt to skip the marinade. Rest the steak at room temperature for 45 minutes to an hour, or return it to the refrigerator for as long as two or three days. Blot the surface of the steak again to ensure that it’s dry. Your steak can't sear properly until any surface moisture evaporates. 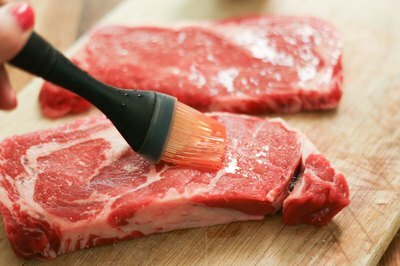 Brush or spray the surface of the steak with a high-temperature cooking oil, such as grapeseed oil. This helps promote browning and prevents the steak from sticking to your grill. Preheat one side of your grill with the gas flame at a low setting, around 225 to 250 degrees Fahrenheit. If you're cooking over charcoal, set up your grill so that one side has only a few coals while the other is intensely hot. Place your steak over the unlit side of the grill. Lower the lid and cook the steak, turning it regularly, for 10 to 20 minutes or until it's nearly done. 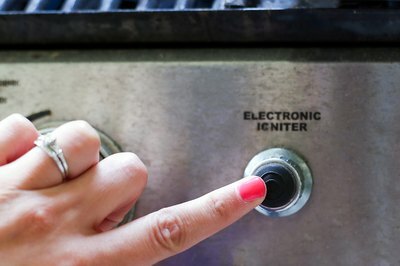 If you're using a gas grill, turn up the heat on the other side of your grill to a very hot setting, 450 to 475 F. If you’re using a charcoal grill, the other side should be preheated at this point. 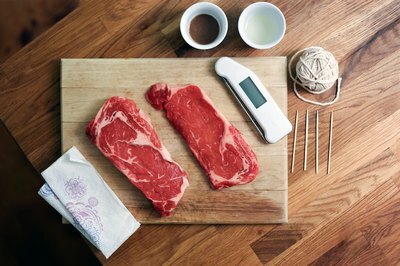 Test the steak by sliding an instant-read thermometer horizontally into the thickest section. It should read roughly 10 degrees below your desired end temperature. For example, if you're aiming for rare at 125 F, you need to see a temperature of 115 F. If you're aiming for medium at 135 F, you're looking for a temperature of 125 F.
Transfer your steak to the hot side of the grill and sear it for 2 to 3 minutes, until well browned. 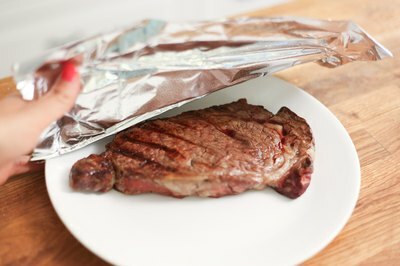 Remove the steak to a preheated plate or serving platter and cover it loosely with foil. Rest the beef for 3 to 5 minutes before serving. Preheat one side of your grill to a high temperature, approximately 425 F. Leave the other side of the grill at a low temperature. If you're cooking over charcoal, let the coals burn down slightly to develop a light coat of ash. Place your steaks on the hot side of the grill. 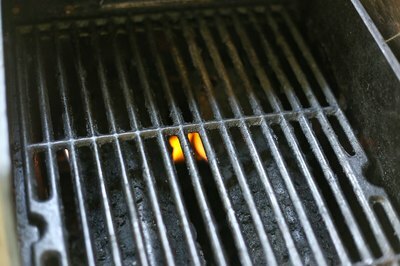 If you want restaurant-style grill marks, lay them at a consistent angle across the grate, and rotate them 60 to 90 degrees after about 2 minutes, once they're well marked. Watch your steaks carefully as they cook. 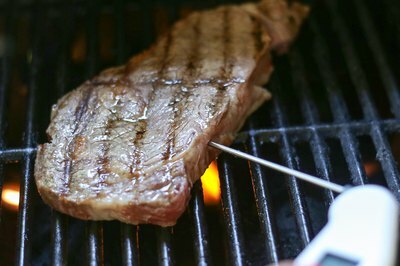 If dripping fat causes a flare-up, move your steak away from the flame or onto the cool side of the grill until it subsides. Grill the steaks for 3 to 5 minutes, until the first side is well browned and moisture is beginning to bead on their upper surfaces. 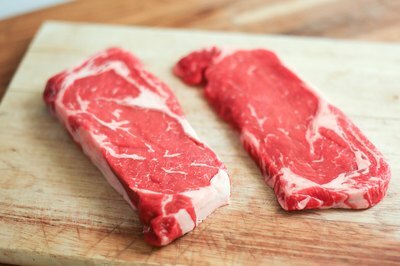 If you turn them when the moisture just begins to show, your finished steak should be rare. If you wait for definite beading, the result will be medium-rare to medium. 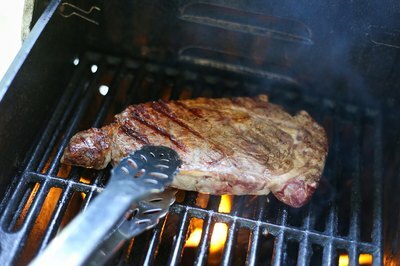 If some steaks are cooking more quickly than others, transfer them to the cool side of your grill. That way, they'll all finish at the same time. Flip the steaks, and cook them for about 1 minute on the second side. Test the steaks with an instant-read thermometer, if they're thick enough, to ensure you've reached your preferred degree of doneness. Remove your steaks from the grill and serve them immediately. Thin steaks don't benefit from resting. 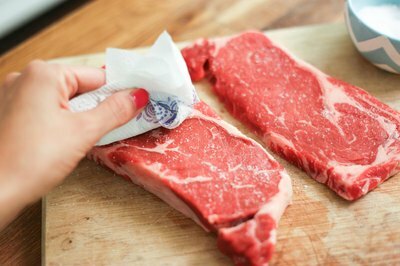 • Coarse sea salt or kosher salt are best for steaks because they lack the iodine that gives table salt a harsh, chemical aftertaste. If you don't have opportunity to season the steaks at least 45 minutes in advance, wait until the last minute. Otherwise the salt will draw moisture to the surface of your steak, where it inhibits browning. Wait until the end of your cooking time to apply black pepper, which can scorch in the intense heat of the grill. • Use the thin steak method for a rib-eye less than 1 inch in thickness. The thick-steak method is better for steaks over an inch, and especially for those over two inches in thickness. The slow initial cook over low heat helps keep the steak's surfaces from overcooking before the middle is fully heated. This also minimizes flare-ups because your steak spends less time at high temperatures. • The line between rib steaks and rib-eye steaks is sometimes blurred, and you will occasionally see rib-eyes with the bone left attached. If it's otherwise properly trimmed -- the steak will look like an oversized letter "P" with a compact round of muscle attached to the bone -- the bone won't affect your cooking time materially. 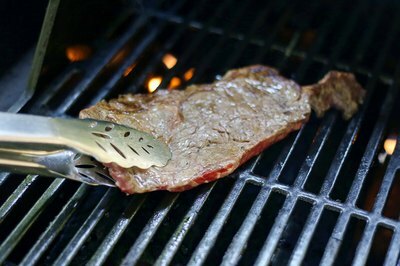 • Traditional grilling instructions call for the steak to be seared first, then finished at low temperature as needed. Doing the opposite gives better control over your final degree of doneness, and the already-cooked surface of the steak browns more readily. • If you've used twine or a toothpick to keep your steak compact during grilling, remember to remove them before it's served.